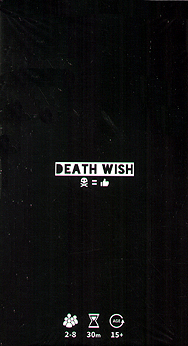 Welcome to Death Wish a deadly and equally absurd party card game about dying from diseases. Choose the path to your demise wisely and be the first player to bite the dust! Combine nasty symptoms and afflicters! Contract silly diseases, from common to rare! Share your unique diagnosis with the group! Interact and hinder players with outbreaks!